Walter S Payne a resident of Fostoria, Ohio was twice elected Commander-in-Chief of the Sons of Veterans, in 1885 and 1886. Upon his election to Commander-in-Chief, he was given the title of General, a title he would carry until his death. General Payne was active in Prohibition politics and was twice the highest officer in the Ohio Good Templars and represented them in Europe two times. Past Commander-in-Chief (PCinC) Payne was a veteran of the Civil War. A residence of Youngsville, Pennsylvania at the time, he enlisted on April 17, 1861 as a 1st Lieutenant and was commissioned on April 23, 1861 into Company D, 4th Regiment Wisconsin Volunteer Cavalry. He was promoted to Adjutant on May 21, 1862 and transferred from Company D to Field and Staff. He was discharged for promotion on March 11, 1863 and was commissioned as a Captain into the 2nd Regiment Louisiana Volunteer Infantry. He evenually rose to the rank of Colonel. PCinC Payne also was an inventor, holding several patents, most notably, the “Payne Tapping Machine”. PCinC Payne was a member of the Ohio Commandery of the Military Order of the Loyal Legion of the United States, Insignia Number 4572. 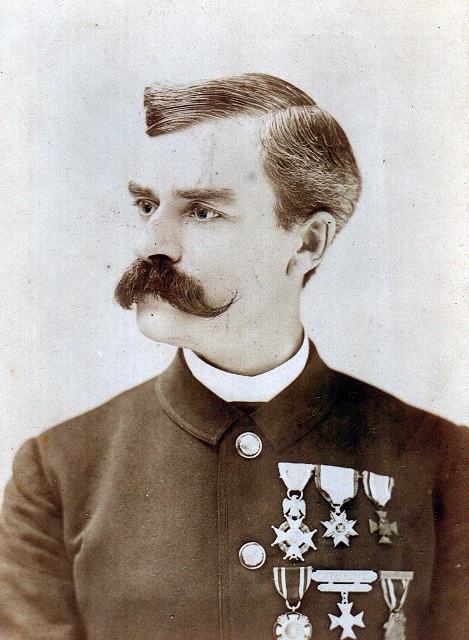 In the Spring of 1901, PCinC Payne and his family moved to Chicago, Illinois to be closer to his doctor and to attempt to regain his lost health. General Payne died October 19, 1901 after an operation at a Chicago Hospital. He was 65 years Old. He was survived by his widow, two daughters and two sons. Cleveland Plain Dealer, 20 October 29, 1901, page 8. Roster of Wisconsin Volunteers: War of the Rebellion. Index to Compiled Military Service Records. Official Army Register of the Volunteer Force 1861-1865. Union Blue: History of MOLLUS, Military Order of the Loyal Legion of the United States. Commandery-in-Chief Electronic Records, Military Order of the Loyal Legion of the United States.